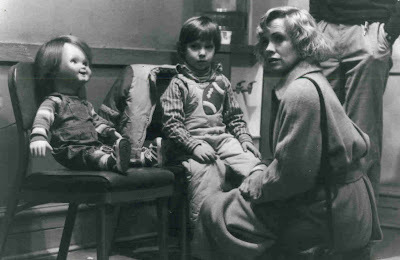 John Kenneth Muir's Reflections on Cult Movies and Classic TV: Muir in View Magazine discusses... Chucky! Did I mention that I'm absolutely huge in Germany? Just kidding. 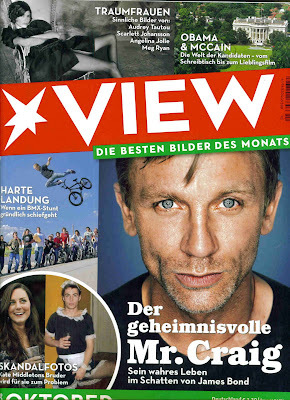 But this month, I am quoted in the German magazine called View. It's a big, glossy, impressive magazine. Kind of like what Life used to be. (The magazine, not the breakfast cereal...). In honor of Halloween and the twentieth anniversary of Child's Play (1988), the mag's editors asked me to comment on the film's cinematic and cultural success and longevity. So yep, I may not on The View with Whoopi Goldberg and Joy Behar, but I'm definitely in View Magazine. First, it seems like -- whether they admit it or not -- many people are terrified of dolls in real life. 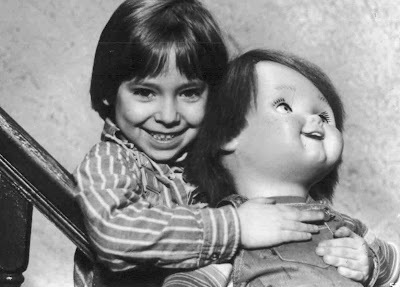 Malevolent dolls are a staple of horror genre going back decades, appearing on TV shows such as The Twilight Zone (where the doll's name was "Talky Tina," for instance.) We seem to fear these toys almost instinctively, so it's the idea that something that mimics our life actually has life itself. As a murderous, living doll, Chucky taps into a common, even universal human fear. Secondly, Child's Play (1988) is not merely an effective and scary horror film, it serves as an amusing satire of the out-of-control American consumer culture in the 1980s. In particular, the film alludes to the Cabbage Patch Doll craze of 1983, in which supply could not keep up with demand, and some American consumers behaved badly (even rioting) to get their hands on these "designer dolls." What was ironic, of course, is that these Cabbage Patch Dolls were rather ugly...as Chucky, of course, is rather ugly, himself. In the film, Mrs. Barkley is reduced to buying a Good Guys Doll from a hobo, because she cannot afford one in a toy store, a reference to the "despised" outsider (a homeless person) in the eighties. Child's Play also deals explicitly with the idea that in the late 1980s, childrens' toy merchandising efforts had literally gone insane. Every toy, it seemed, in that era (from Smurfs to My Little Pony to G.I. Joe) boasted a catchphrase, a television program, a breakfast cereal, a line of clothing, and toys galore to help "sell" the product. Again, Child's Play explicitly comments on this idea, developing a whole line of Good Guys products to go with the doll. So Child's Play offered the best of all combinations: It was simultaneously a scary movie, a funny movie, and a scathing social commentary on the culture that produced it. Chucky's descent from legitimate (though satirical...) cinema "boogeyman" to silly figure-of-fun matches Freddy Krueger (A Nightmare on Elm Street's) similar descent. There's a saying that familiarity breeds contempt, and in terms of the horror genre, the more familiar the audience is with a screen monster, the harder it is to make that monster appear fresh and scary. Therefore, as in the later Chucky films and later Elm Street films, the "monster" begins to crack jokes or becomes less menacing. The situations become more comical. Believability is sacrificed for jokes. The horror diminishes and the comedy comes to the forefront. I personally prefer the original Child's Play to all the sequels. It offers the best balance of terror, satire and laughs. Though, I must say, Bride of Chucky (1998) was engaging and even audacious at times. Well, in the early 1980s, the slasher paradigm ruled the genre. This meant that masked killers armed with machetes hunted down and killed teenagers in variation after variation on a theme (with titles such as Happy Birthday to Me, My Bloody Valentine, Prom Night, Terror Train etc.) Later in the 1980s, Wes Craven injected the notion of "rubber reality" -- the supernatural -- into the slasher formula with the watershed A Nightmare on Elm Street. Freddy Krueger wasn't merely a slasher, he was a dream demon, a supernatural avenger. Chucky fits into the pattern of the late 1980s rubber reality trend because he is too a supernatural killer: a doll imbued with the malevolent life-force of a serial killer. (One who commands voodoo powers, no less). Yet, to some extent, at least, Child's Play generally escaped both the slasher and rubber reality label because the film centered on "the American family" (not merely horny teenagers), and because it commented ironically on what was happening in the consumer culture. It was smarter, wittier, and sharper than the average slasher or rubber reality sequel, and this made a huge difference in terms of audience reception. Child's Play felt not like a familiar retread...but a bracing (and intelligent) original vision.